1.Flexible:Choose to plug in up to nine Ethernet or Fast Ethernet devices and mix in up to four IEEE802.3af IP-based devices like wireless access points or IP-based network surveillance cameras. Place these IEEE802.3af-compliant devices where they belong - high up on walls and ceiling for maximum coverage - or anywhere else you need them. Power and data are carried over standard Cat 5 cabling. 2.Plug and Play:The standards-based PoE Switch LinkS-AF-81 senses and adjusts for network speed and cabling type automatically, for easy integration into your existing 10/100 Ethernet network. For PoE, the switch automatically detects IEEE802.3af-compliant devices, and supplies power as needed. Front panel LEDs keep you informed of switch and PoE status. 3.Quiet and Compact:Engineered for compact convenience, it durable metal case that is easily positioned on your desktop or a wall, using the included mounting hardware. The fan-less design quietly integrates with your small office environment. 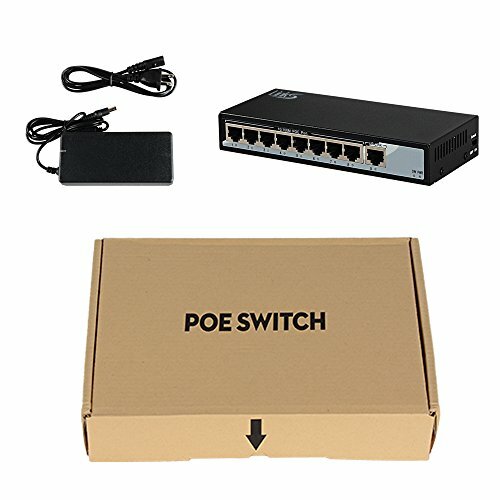 4.Great Value:With data switching and Power over Ethernet integrated into one unit, the PoE Switch LinkS-AF-81 saves space, reduces cables and eliminates the requirement for dedicated electrical outlets - lowering installation costs, simplifying installation of PoE-capable devices, and eliminating the need for electricians or extension cords. All in all, a great benefit for a modest price. If you have any questions about this product by avedio links, contact us by completing and submitting the form below. If you are looking for a specif part number, please include it with your message.